South Florida Website marketing & South Florida Search engine optimization. SEO. Internet marketing. Search Engine Marketing. It’s called many many things, and is a misused and misrepresented product, but it all comes down to getting your website or landing page in front of the right customer or potential client and making the sale or lgetting the lead. MYC will help you increase Quality and Amount of your Website Traffic and Qualified Leads with our local search engine optimization services. We start with very basic Fort Lauderdale, Plantation, Weston, Boca, Miami, etc SEO keywords and even go all the way up to national level keywords. This package is excellent for local company branding and local customer referrals/leadgen programs. How many times do potential clients research a company, service or product on Google before the buy or sign up? Prospective customers/clients go to search engines (Google 90% of the time) more than any other source in order to find services and/or products. Every day your prospective consumers go online to research products or services. 72% of consumers who did a local search visited a store within five miles. (Wordstream) 30% of mobile searches are related to a location. (Google) 28% of searches for something nearby result in a purchase. (Google) Local searches lead 50% of mobile users to visit stores within one day. (Google) Nearly one-third of all mobile searches are location-based queries. (The SEM Post) When a customer types “Your Business/Location” into Google it’s vital to be there and to be on the top of search or in the maps listings. With our Local SEO Tune Up package customers will quickly find your business on the first page of Google. If your business information is not available online, the customer loses trust and may choose another company’s service or product. Get your business noticed today by using our Local SEO Tune Up Package. 28% of searches for something nearby result in a purchase & upwards of 20% of all monthly searches are for local businesses according to Google, the world’s top used search engine. Our standard Search Engine Optimization package is perfect for companies who do local and/or regional business. We target up to 5 specific local/regional keywords to help potential customers find you online. How much is a new customer worth to you? By ranking higher for the proper keywords MYC can significantly increase your leads and profits for your business. MYC will specifically target local areas to keep the clients in your backyard. Let us help your new & unknown customers find you. The truth is 75% of all people on the average website never scroll past the first page on search engines such as Google or Yahoo. Our more comprehensive SEO package is for businesses who need to market their product or service on a larger national level. Our team will extensively research up to 15 lucrative and specialized keywords to help generate the most revenue possible for your business. MYC will complete weekly search engine optimization and link building to ensure your business keywords make it to the top ranks of Google. Want to compete with the larger national & regional names on the Internet? With our Comprehensive SEO package we build up to hundreds of links per month pointing directly to your website. This includes the links we view as useful such as social bookmarking, web 2.0 website creation, article submission and directory submission. The first result on Google gets almost 41% of all the search traffic. Everything past the first result gets significantly less until finally no traffic at all. No one wants be second best? 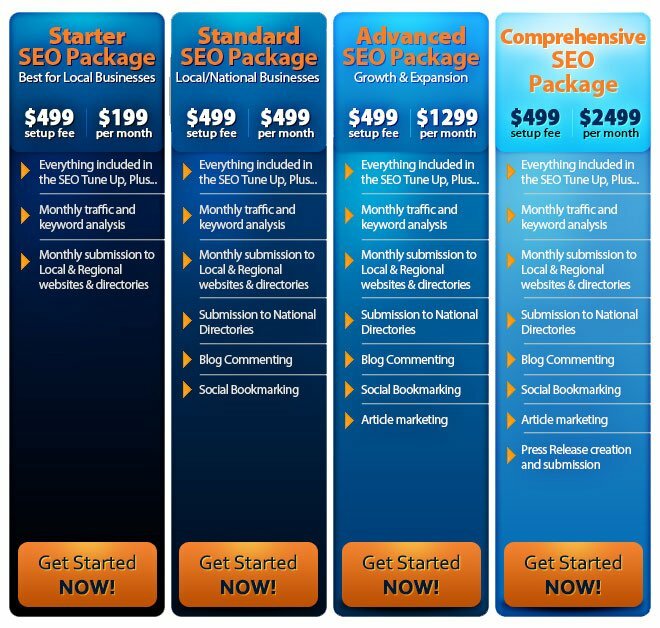 This SEO package is for the company owner who wants to be the best. MYC will give you the most powerful link building strategy with many years of experience behind it. This SEO package allows us to invest a a massive amount of time on your website building and promoting thousands of links per month, authoring and composing multiple original articles, multiple book marks, blog posts, directory submissions and more, resulting in THOUSANDS of new monthly links to your website. The result of this package gets you a massive increases in your search engine rankings.